Booking Calendar - is the ultimate WordPress booking system. With Booking Calendar your visitors to your site can check availability and make reservations for specific day(s) or time slots. Your customers can even search available properties or services for specific dates and pay online for their own bookings. You will receive email notifications and can manage the reservations in the intuitive and powerful booking admin panel. Booking Calendar is built to work out of the box, but you can still configure different settings to best fit your business workflow processes, and customize the form and calendar for a natural fit to your site design. Booking Calendar has thousands of users. Whether you're operating a big hotel with hundreds of rooms, needing to create a multi-user portal for accommodation owners, or you're a sole business owner who needs to automate bookings for your accommodation or service, Booking Calendar has you covered in every way. It's great for anyone with a need to book a service or accommodation. Resource scheduling (bed & breakfast, cottages, hotel rooms, houses, apartments, rooms etc.). Equipment rentals (cars, bikes, computers, technical equipment, pools, etc.). Client scheduling (photographers, lawyers, beauty salons, spas, massage therapists). Meeting scheduling (coaching, phone advice). Event scheduling (conference, course, fitness center, yoga class, gym). Patient scheduling (doctor, dentists, clinic, medical). Any other service, requiring reservations on specific day(s) or times. Booking form and calendar support fully responsive designs that looks great on any device. View and manage bookings via a beautiful and friendly admin interface. Supports unlimited number of booking resources (properties or services). Configure the booking form structure and fields, and choose from a range of sleek calendar skins to better fit your site design. Define email notifications for common booking actions. Activate and configure payment systems integration with the most popular payment gateways. Book specific timeslots for selected dates. Multiple bookings of the same entire day(s) by different visitors, up to resource capacity. Set single, multiple, minimum and maximum number of days selection. Supports half day booking. Set season rates and costs dependent on selected days or from options, coupons or deposit payments. Set availability for a specific season. Enables editing of existing bookings by the admin or visitor, who made the booking. Search available resources for specific dates and number of visitors. Supports WPML and qTranslate plugins for multilingual websites. Supports multiple independent booking admin panels. „ After searching to find a free or reasonably priced WordPress plug-in to manage our sponsorship process, it was obvious that the Booking Calendar was the highest quality plug-in available. While we started off with the free version, we soon upgraded to the Large Business version which was well worth the money. There are so many useful features, with updated features added regularly. The best part has been the support provided. Because our need for this program is not a typical, we have been able to highly customize the program to fit our sponsorship program. The technical support with this has been fantastic and timely. „ We had been testing a variety of plug-ins before deciding to go with WPBOOKINGCALENDAR. And I have to say, we made the right choice. „ In our technologically advanced world customer service is often forgotten. Many of us being forgotten once the sale is made. Booking Calendar is a company that not only delivers a "Rolls Royce" product, it also delivers a level of customer service that is quite extraordinary. It's rich in knowledge, informative and comes with a level of patience that goes beyond anything I have ever experienced. „ I recently purchased the Online Booking Calendar for a client’s website who’s B&B had a few complications. On purchasing the Hotel Edition, the help I have received has been fabulous, the response time quick and the manner of the staff exactly what I was needing. And of course they gave me a solution to my problem! „ I am really digging the Booking Calendar plugin. After researching all available options, this one was by far the best. I needed a plugin that would provide a calendar and form for customers to book dates for a venue, and this one is perfect. It has helped me to design a simple booking setup for my clients website. My clients are going to be very pleased, as this will help their business dramatically. Their old website had a very, very bad process for booking, where you have to create an account before even checking availability. Using Booking Calendar, we're working to create a simple and intuitive user experience for my client's customers, while organizing the bookings into WordPress. I'm using the Premium Edition version, which is sufficient for this use. „ Excellent Plugin with Premium Support. 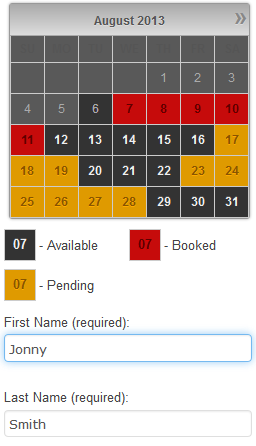 After looking around at many hosted booking solutions for a paintball site client I chose the pro version of the booking calendar plugin as the price is a bargain and the look and layout superb. After adding some other various plugins to the client site I also found out the support was as first class as the plugin! An excellent piece of code with top notch support from the developer. I have no qualms about recommending this comprehensive piece of software to any developer looking to integrate an online booking resource to their wordpres based site. „ I just want to express my pleasant surprise about this plugin! I've got a client who needed a serious booking system realized within days. A quick research showed that this is my thing. After few emails with the support, I've had no doubts that this plugin is doing the job. I was able to build and configure the required system in short amount of time. I had some small issues, but the support was amazing - they answered all my questions within hours! I would like to recommend this system to every person that needs to build a complete booking system which has a lot of features. Everything works like a charm. And if you happen to have some issues or do not understand something - the support is amazing! They will certainly support you! „ We were commissioned to build a website for a British charity outward bound hostel. Booking the accommodation needed to be done with the management choosing the room allocation. We needed the flexibility to apply unusual costing rules following the charities room subsidy scheme. There was also a requirement for summary calendars showing overall availability of specific types of room. Hotel Booking already covered most of our requirements so we took a view why reinvent the wheel. We also liked the fact that we would own the license for the free standing programme and host our own data, unlike many of the other booking systems which require a 3rd party infrastructure and ongoing fee. „ I want to say that the Support for Booking Calendar is the best I have come across in 30 years of computing. I purchased the Premium Plus version for a client's hotel site. Being a new user I had quite a few questions to answer before purchase and a whole load more after purchase. Every single question was answered and several changes made to the CSS files (because of my WordPress Theme)and here is what makes the Support so excellent... About 70% of my questions were answered in just a few minutes, the other 30% were answered in less than 24 hours which considering several hours of "time difference" is just incredible. „ My client was using trumba and paying a monthly fee for booking and calendar services. The 1 time fee for this software was the same price as 4 months of any online calendar services... and its interface is gorgeous. „ I am in the process of developing a rock climbing site based on the WP platform for a client. The client needed a way to allow customers to reserve days for climbing and courses. The groups could range from a few people to a group of fifty. I first thought the easiest method for accomplishing a booking system would simply be writing a quick and dirty plugin to solve to problem. 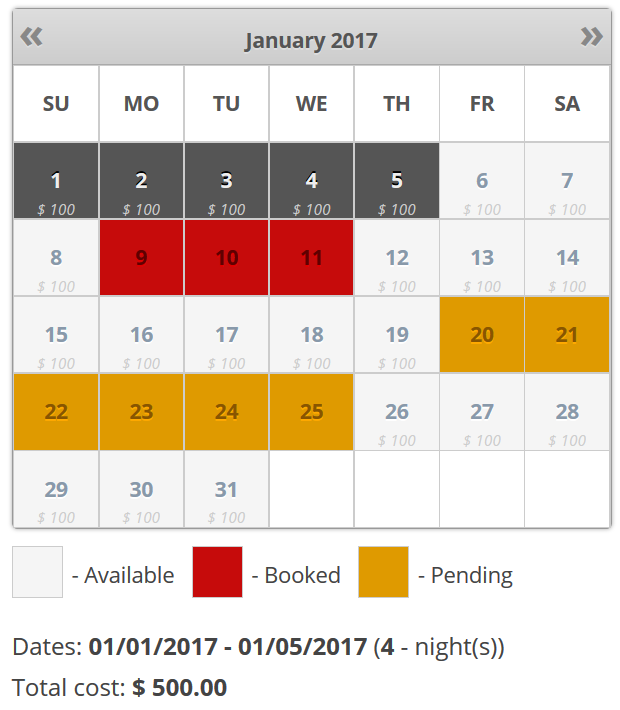 After a little bit of research I discovered the Booking Calendar plugin. I know the plugin is most commonly used to reserve hotel rooms, apartments, etc. but because it is so flexible I was able to customize every element displayed to the user, reworking it perfectly to fit my needs. Now the customers can reserve their dates (even multiple customers on the same day i.e. multiple groups) and can even process payment fully through the site. This plugin truly saved me hours of developing and headaches. The developer of this plugin responds almost immediately to support requests and he is more than willing to work with you to customize the plugin to fit your needs. The AJAX interface adds a nice layer of interactivity and the included style sheets also makes it super simple to integrate the look of the booking system flawlessly into my site. I really recommend this plugin to anyone needing any sort of booking system, not just for hotels or apartments but for any resource needing a reservation. „ It's help me to manage in real time my availability and help my client to make a reservation in confident. „ Booking Calendar plugin can do more than you think it can. „ Fantastic support! Bought the plugin along with Booking Manager a few days ago for a client install, had a few issues with custom fields. Emailed for support, and got a response back in less than 12 hours, and had a solution to the issues along with a code fix with another few hours. Very happy with the plugin, and super happy with the level of service. Requirements: WordPress 4.0 or newer, jQuery 1.9.1 or newer, PHP version 5.2.4 or newer, MySQL version 5.0 or newer.